In the never-ending quest for something new, many growers and hobbyists have hit upon these wonderful plants in recent years. Streptocarpus species are native originally to Africa and Madagascar (and possibly a few species in Asia). They are closely related to the African violet and grow under similar conditions. Most exciting is the profusion of blooms that hybridizers have been able to create. Streptocarpus flowers can be found in red (a relatively recent addition), blue, purple, yellow, white and orange. They are typically borne on upright stems, hovering over the plant's flat, textured leaves, and can be either a single flower per stalk or multiple flowers per stalk. Although these are relatively new plants and we're still learning how to perfect their cultivation, societies have already sprung up to trade knowledge and plant material, much like the more organized societies that support African violets. Light: Most Streptocarpus species grow on rocky, somewhat shaded hillsides or river banks, sometimes growing on fallen tree trunks or even rocks. Thus, they like dappled sunlight best. Grow them in an eastern-facing window or under fluorescent tubes. Water: The soil should be allowed to dry between ​waterings. Streptocarpus is susceptible to root rot. Because of their delicate leaves, consider watering from the bottom (wick watering), but never let the plant sit in water. Let the soil become rather dry between waterings. Temperature: Moderate to cool. Intense heat can cause wilting and plant failure. Soil: A loose, very well-drained, very rich potting mix. Fertilizer: Fertilize with a weak liquid African violet fertilizer during growth and flowering. They seem to thrive with a steady supply of weak fertilizer. Propagation is accomplished by seed or leaf cuttings. To propagate Streptocarpus seeds, spread the small seeds on top of a sterile seed-starting mixture and place in a well-lit and warm area. The seeds need light to germinate. The plants are more commonly propagated by leaf cuttings, much in the same way African violets are propagated. Take a single leaf with its leaf stalk and bury it in a seed starting mix, then place the pot in a warm, humid area until new growth emerges. Finally, older, more mature plants can be divided during repotting. Repot larger plants in spring, at the beginning of the growing season. Like African violets, they have a shallow root system, so do not need an especially deep pot, but they like to have room to spread their roots throughout the top of the growing medium. When repotting a mature plant, be careful not to destroy too many of the fine roots near the soil surface. During repotting, make sure to use a very fast-draining soil—Streptocarpus thrives in fast-draining conditions and does not benefit from a peat-heavy soil that retains water. Since the introduction of the main Streptocarpus species into the plant trade, hybridists have worked to create dozens of interesting varieties. 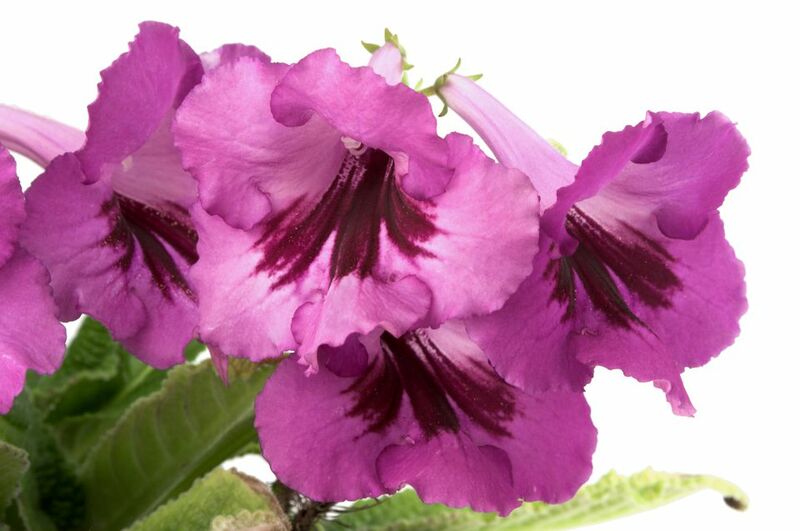 Choose your Streptocarpus based on its flowers and your preference. The key to growing good Streptocarpus is to provide adequate moisture balanced with adequate drainage. No doubt like African violets, the most common problems besetting these lovely plants have to do with watering—usually too much of it. They should never be allowed to sit in water in a plant tray or water-logged soil. They also dislike strong, direct sunlight, which will burn their leaves. Some species have the unusual habit of annual leaf die-back, with the leaves turning brown from the leaf-tip halfway down the leaf. This is normal. Finally, the healthiest and most heavily flowered Streptocarpus are those that are fed regularly. Keep a steady supply of African violet fertilizer flowing. Treat pests, such as mealybugs, aggressively.